So, the Leafs are waiting (again!) for someone to step up and claim their number-one goaltending position. It seems that neither Jonathan Bernier nor James Reimer has taken (or been given!) the opportunity to run with the starting job. 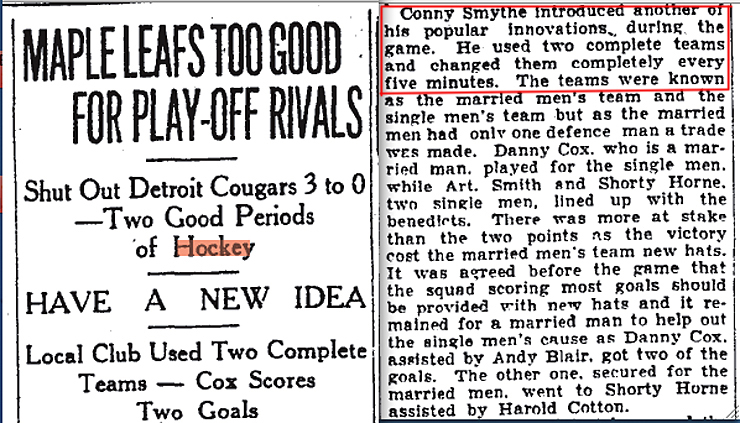 You’ve got to think coach Randy Carlyle and the rest of the team brass are getting a little bit desperate … but chances are they won’t resort to something Conn Smythe tried back on March 9, 1929. The 1928-29 season was the lowest scoring in NHL history. Teams combined to score only 2.9 goals per game that season, meaning the average score of any game was 2-1 in overtime. 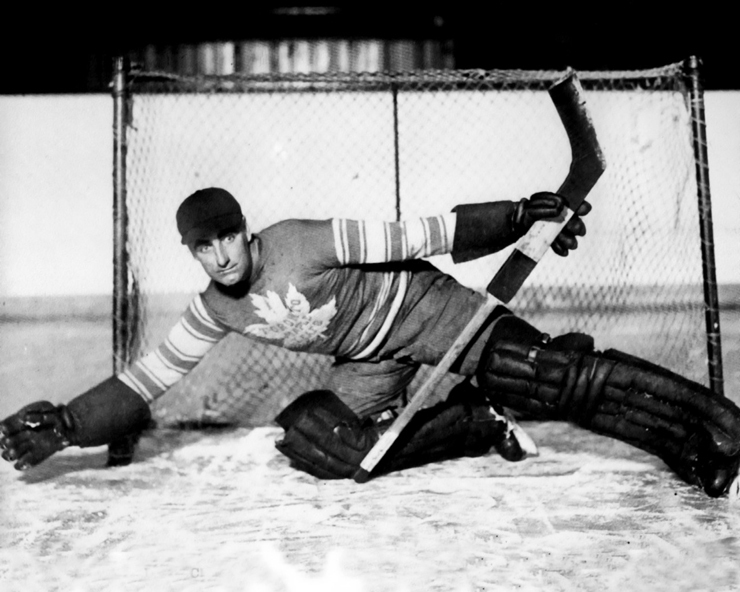 George Hainsworth of the Canadiens posted a record 22 shutouts during the 44-game season and had a goals against average of 0.92! Toronto’s Lorne Chabot posted a 1.52 average but that was only good enough to rank him eighth among the starters on the 10 NHL teams that season. So Conn Smythe had every reason to see what the young Benny Grant (who’d led his hometown Owen Sound Greys to the Memorial Cup as a junior in 1926–27 before going pro in 1927–28) could do. This was an era when the game’s top stars – especially defensemen – often still played the full 60 minutes, or very close to it. 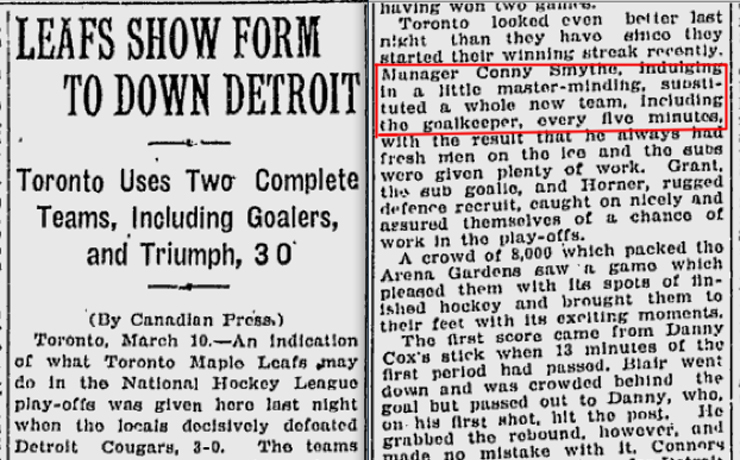 But in Toronto’s game against Detroit on March 9, 1929, Smythe chose to “roll” two full lines … including his goaltenders! Smythe made changes approximately every five minutes (presumably at whistles, not on the go) and the fans seemed pleased with the results in a 3-0 victory. Smythe continued to use both Chabot and Grant for the final three games of the season, but he rotated them somewhat more traditionally by switching them up between periods. Over the next few seasons, the Leafs occasionally tried to work Grant into a regular rotation, but it never really panned out. Grant play professionally through the 1943-44 season, but only saw action in 52 NHL games in all those years. Because of the way the Leafs used him, his record is somewhat difficult to determine, but was either 17-27-4 or 18-27-4. So, why were the Leafs so determined to try Benny Grant when they had a goalie like Lorne Chabot, who still ranks highly among the all-time shutout leaders? And why is Chabot – who has numbers comparable to all the great goalies of his era that have been enshrined – not a member of the Hockey Hall of Fame? I obviously never saw Chabot play, so I can’t say for sure, but I once asked 1930s NHL defenseman Alex Levinsky what he thought about it. Levinsky was a teammate of Chabot in Toronto and Chicago and a relative by marriage of the former wife of a cousin of mine. (Jewish Geography … or, actually Jewish Genealogy!) “He wasn’t that good,” Levinsky told me. That seems hard to believe, but then again, there must be a reason why Chabot was traded five times in his 11-year career, including each of the final four seasons he played. Frank Selke once said his teammates all liked him, but you’ve got to think that if Chabot was playing today, fans and media (and probably the analytics crowd) would be all over him! Good ol’ Shabotsky! I think one of his relatives alleged he was an advocate for players’ rights, and that this might have contributed to a trade or two. Interesting! Might also explain his exclusion from the Hall … though doesn’t really account for Levinsky’s comment. Great photo Eric & a compellign story! I knew the name Conn Smyth from Thoroughbred horse racing…he was a shrewd man who knew his hockey & a good sound horse too!! !